I have an obsession with tornadoes. I don’t know why. I don’t know where it came from. But all I know is they have always been my biggest fear and for some reason lately I just CAN’T STOP watching videos online, reading articles and scientific websites and watching Tornado Road and Storm Chasers on TV. Since I was little I’ve always been deathly afraid of thunderstorms because I somehow convinced myself a thunderstorm would automatically lead to a tornado. I’d be playing softball and it would start to storm and I’d get hit by the ball because I’d be too busy looking at the clouds trying to seek out a funnel cloud. When a severe thunderstorm warning would come on the bottom of the TV screen I’d make my mom go hide in the basement with me. One summer when I was in Virginia with my teen travel camp I hid under the sink because there was a tornado watch. And, the worst of it all, the only nightmares I ever seem to have involve tornadoes, and I’ve been having TONS of nightmares lately. Now, if you Google dreams and tornadoes you will find that they sometimes mean you’ve lost control of your life and are feeling overwhelmed. I can’t tell you how accurate this is to my life right now. Sure there has been a lot going on in the country with tornadoes lately and that’s all that has been in the news the past couple of weeks. But I’ve also been in a weird place the past few months. Maybe because I’ve been feeling so stagnant, bored, in need of a challenge, itching to travel and hike up a mountain. Or maybe because my roommate and closest friend in Connecticut moved across the country and it’s taking time to adjust. Or maybe because I’m trying to figure out my next move and make some big life-changing decisions- and that all scares and excites me. I’m not really sure what it is exactly BUT what I am sure of, is out of all this tornado hype something good evolved. Something more than good. Something INCREDIBLE. The most delicious tornado went off in my kitchen this weekend. 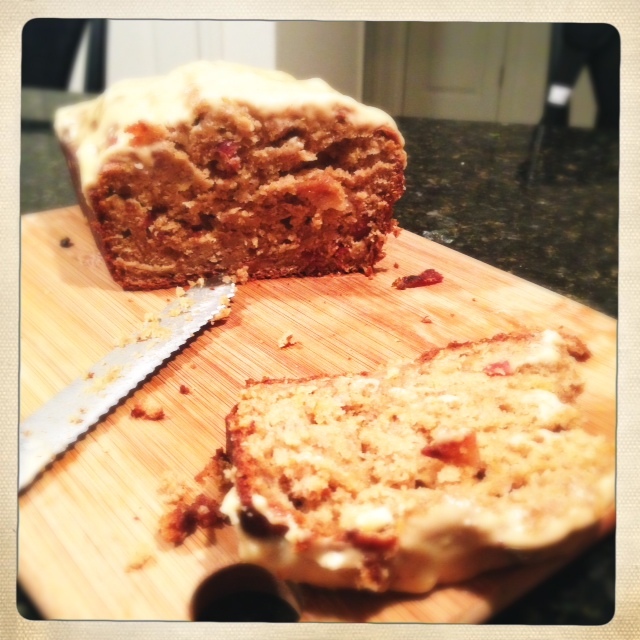 I made a Peanut Butter and Cream Cheese Banana Bread with Candied Bacon. Yes, that’s right. Peanut butter, cream cheese and candied bacon, all in one. And, to add to the amazingness? Topped with a peanut butter and cream cheese icing. 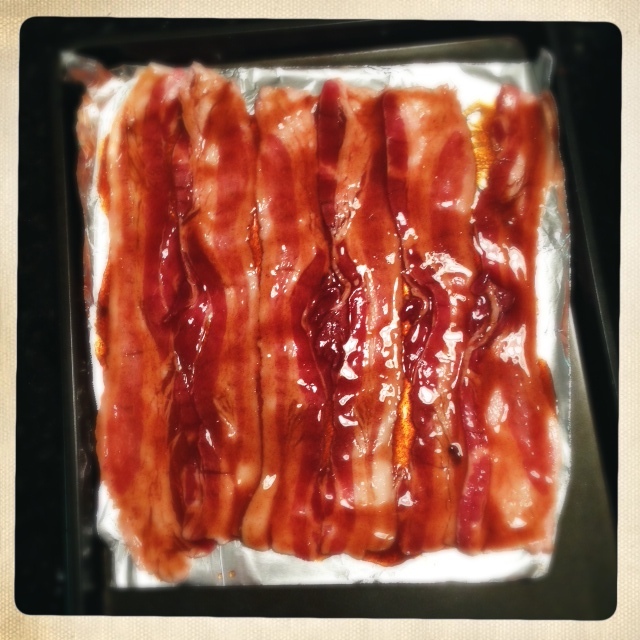 Candied bacon has to be one of the best things I’ve ever had in life. 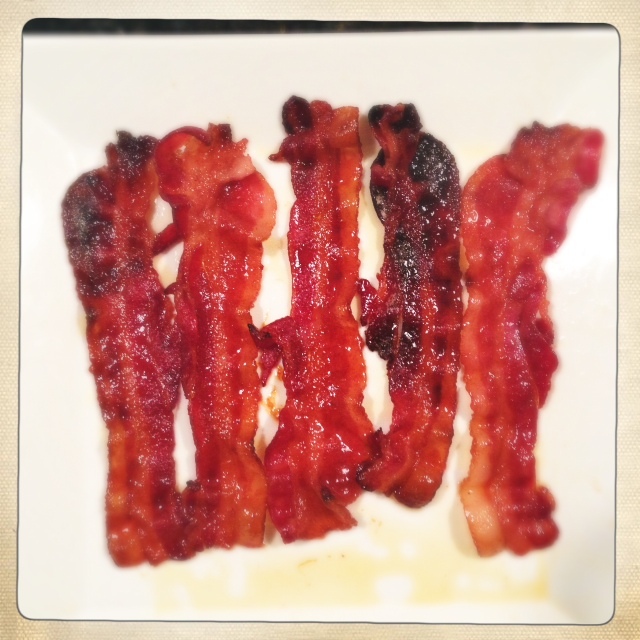 The sweetness and chewiness of the maple syrup and brown sugar when it caramelizes mixed with the spiciness of the cayenne pepper and the saltiness and crispiness of the bacon. All the best textures and flavors in one. So good, I ate half of it before it actually made its way into the batter. Now I have to say, I’ve been on a major peanut butter and banana kick lately. 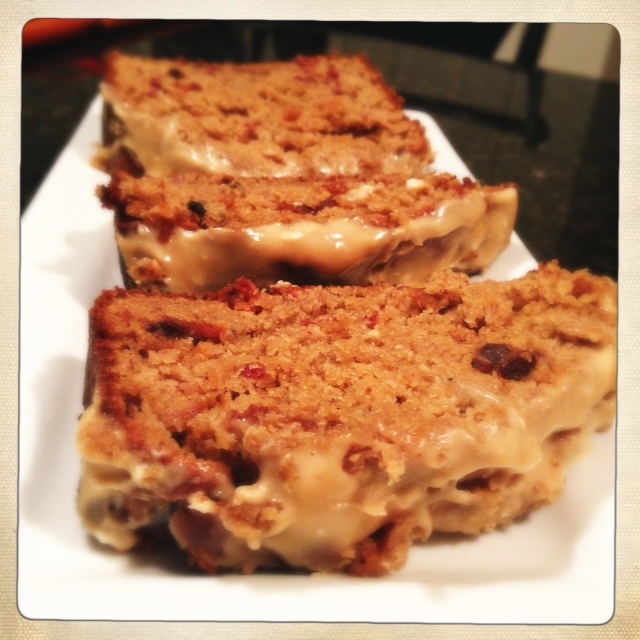 Which is what inspired me to add the peanut butter to the banana bread. I must go through a jar of peanut butter a week! I know it’s not that good for you (everything in moderation) but I can’t seem to just stop after one spoonful. But who cares, it tastes so good! That’s what the gym is for, right?! Except when you eat peanut butter right before a run…I don’t recommend it. And bananas, I can’t stop baking with them! In pancakes, cookies, breads. 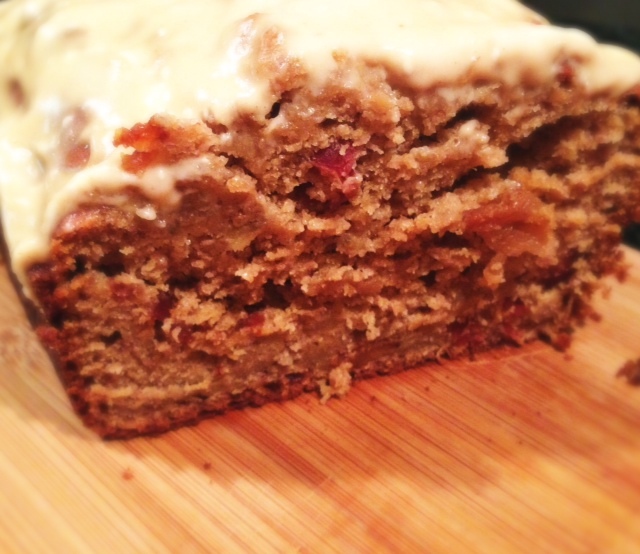 But at last, I combined all my loves into one, creating the most delicious, moist and flavorful banana bread yet. And a tornado in my kitchen while doing so. And it was all SO worth it. You must try it!